Click the image below to download Apple Tree Finger Numbers. *Coordinates well with WunderKeys Primer Book 1, Module 1. Including holiday-themed fun throughout the year is a fabulous way of keeping your WunderKeys students motivated and your lessons fresh and fun! Young children love the excitement of the holidays and it’s a “wunderful” way of adding needed review or a challenge to your lessons. Plus…WunderKeys makes it easy for you to plan exciting lessons by sending you free supplementary materials! Be sure to subscribe to WunderKeys to receive our games, duets, sheet music and more! At every lesson, WunderKeys students learn to complete patterns using Finger Friend manipulatives (available to teachers on the member’s portion of this site). 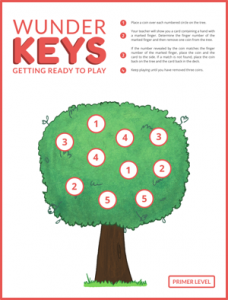 This valuable activity helps to strengthen musical skills (being able to identify and predict patterns and sequences in music) as well as math skills (being able to recognize and predict number patterns). Today we’re sharing 3 new ways you can use your patterning manipulatives! Draw a circle on your whiteboard and place 3 Finger Friend manipulatives inside. Ask your student to first count the Finger Friends, and then to draw the number 3 beside. Add or subtract manipulatives and have your student re-count and then write the new corresponding number beside. Alternatively, write a number beside the circle and have your student place the correct number of manipulatives inside the circle. This activity can then be turned into a “more than, less than” activity if you have two circles with two sets of numbers on the same board. One of the concepts covered in Book 1 is “Same vs. Different”. This is an important pre-reading concept that can be expanded upon using the patterning manipulatives. Create two groupings of Finger Friends (either groupings that are the same or groupings that are different) ask your student to “Circle the group that has Finger Friends who are the same” or “Circle the group that has Finger Friends who are different.” You can expand upon this activity by making “Same, same, same, change!” arrangements for students to move to physically (clap, clap, clap, jump) or to play on the piano. By drawing a single line through the centre of your white board or piece of paper, you can create a high-vs. low board. Arrange Finger Friends above or below the centre line and ask “Who is high?” and then “Who is low?” Next, place 3 Finger Friends in a varying “high and low” arrangement, and have your student play corresponding high and low keys based on what they see. Alternatively you can play high and low sounds on the piano and have your student arrange the Finger Friends above or below the line according to what they hear. Looking for more tips and sharing? WunderKeys now has a Facebook group! Check it out and join in on the discussions here. Do you subscribe to WunderKeys? One of the most important steps in becoming a WunderKeys teacher is to be sure you are a subscriber. This is separate from registering for access to the site as it is for teachers who are actively teaching WunderKeys only. If you haven’t been receiving our supplementary resource send-outs then it’s likely that you need to subscribe! Use the link below to be sure you don’t miss out on any of the fun. Our next send-out happens next week and we’ll be sending links to all of our previously-sent materials as well to get you caught up and ready to roll! It’s the start of a new school year and hundreds of new WunderKeys teachers have added this program to their studios all over the world. If you are one of these new teachers, then welcome! We’re thrilled to be a part of your excitement as you add preschool piano lessons to your studio’s offerings. 1. Subscribe as a WunderKeys teacher. This gives you access to all of the “extras” we send out such as games, new duets, activities and marketing help. 2. Let us create some beautiful advertising materials for you! This is a free service and we’d love to help you get started on announcing this program to your community. Email info@wunderkeys.com with your studio name, email and phone number as you’d like them to appear and we’ll have them back to you within a week. 3. Get online with a complimentary personal WunderKeys website. We’ll personalize a webpage for you and optimize it for search engines so parents in your area will find you when surfing online. 4. Be sure to be completely familiar with the entire program before you begin teaching. We’ve posted all of the info you need as a new teacher under the member’s section of the site (click here). Access is free and will allow you to view pdf’s, mp3’s and videos that will show you how to teach WunderKeys. 5. Finally, be sure to check out the 3 method books to gain a true understanding of the program in it’s entirety. It’s important to know where your students are “going” with this program to adjust your approach accordingly. We provide unlimited continuous support to WunderKeys teachers. If you have a question just ask! Welcome and best of luck as you get started with WunderKeys in your studio.